It's always a letdown when shows don't get to shine. Even worse is when a series shows so much potential, but gets canceled after only one season. Many of them go on to become cult classics, but we still have to wonder what could've happened if they went on for longer. C'est la vie. "Get Down" The Baz Luhrmann Netflix series about the rise of hip-hop contains great music and set pieces that make it easy to binge-watch and enjoy. That's not including the great leads, which instill the characters with an electrifying innocence and humanity. However, the streaming service canceled it after one season. 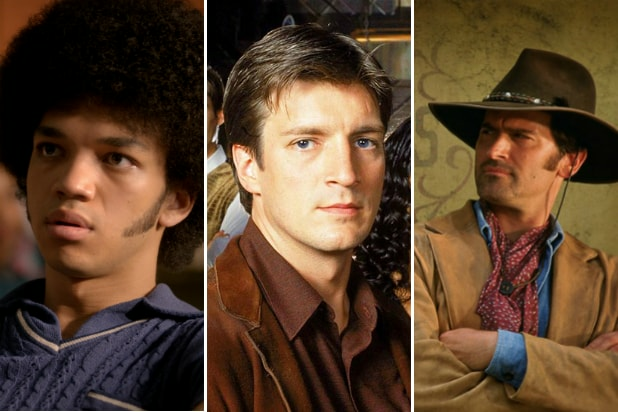 "Firefly" The cult TV show to top all cult TV shows. The one-season Joss Whedon sci-fi epic told the tale of a crew of smugglers on the spaceship Serenity and their adventures on the fringes of a broken society. It was famously canceled after only 12 episodes, but was able to complete its journey thanks to companion film "Serenity." "Freaks and Geeks" It's worth watching just to see baby versions of people like James Franco, Jason Siegel, Seth Rogan, Busy Phillips, and others, but it's also a genuine take on high school and the constant need to feel like you belong. "Undeclared" Think of this as the sequel to "Freaks and Geeks" that you never actually got. While not as good as its predecessor, the Judd Apatow-produced sitcom takes many of the same actors and sends them to college. "Almost Human" This drama was about a hardened cop (Karl Urban) who's paired up with an android (Michael Ealy) to solve crimes. It was, at its core, a police procedural but it was heightened by the high-quality special effects, the heavy sci-fi, and the chemistry between the two leads. Plus, there was so much to explore in the world that was created. "The Tick" Amazon resurrected the character in a new series starring Peter Serafinowicz, but the one most people remember is from 2001 and stars Patrick Warburton as the delusional superhero. In just 10 episodes, Warburton proves why his deadpan, physically intimidating portrayal of the character has endured. "Constantine" People have tried to adapt the comics character to the screen multiple times (remember Keanu Reeves' version?) but in one season, Matt Ryan proved why he still voices the DC demon hunter. The NBC show was funny, but created high stakes situations for Constantine to get himself out of. However, it got the Friday night death slot, dooming it to cancellation. "Eerie, Indiana" This early 1990s show about weird suburbia sounds like a less violent version of "Twin Peaks." A kid moves to the strange town of Eerie only to be confronted with several extraordinary and increasingly ridiculous scenarios. Dogs talked, Elvis showed up, and by the end, the characters were breaking the fourth wall. It was ahead of its time. "Bunheads" In between "Gilmore Girls" and the "Gilmore Girls" revival Amy Sherman-Palladino put out "Bunheads," a drama about a Las Vegas showgirl that winds up in a small town ballet school. The show combined Sherman-Palladino's famous banter and the personal drama that makes you care about characters. Plus, some of the dance sequences are incredible. "The Adventures of Brisco County, Jr." Just watch it because it's a show starring Bruce Campbell. If you're a Campbell fan, we don't need to convince you. If you're not, why aren't you? "Tremors" Back when "Tremors" was a franchise you could get behind, the series version, which of course only lasted one season, really attempted to expand the universe. It fleshed out the characters in Perfection Valley and gave them even more experiments to fight. It's more of a novelty than anything, but it's fun. "Selfie" This is another show with a great cast and a terrible premise. Many disregarded the show, which starred Karen Gillan and John Cho, because of its apparent hatred towards social media (it was about a woman who was too obsessed with social media). However, it did eventually dig into the relationship between the two and they both had amazing chemistry. "Terra Nova" It drags a bit in the middle, but the sci-fi series sets up one of the most fascinating worlds in TV's history. Here, a family helps to set up a colony 85 million years in the past. So things you have to look forward to: dinosaurs. Lots of dinosaurs. "The Beast" This was Patrick Swayze's last acting role before he died of pancreatic cancer and his turn in the crime drama didn't disappoint. The A&E show was grittier than expected, and is worth watching just for Swayze's performance alone.